The shishalh-:tl’extl’ax-min are the authority of the people. Mus-swiya and Xwu’p’a’lich are elders and they want these Trees preserved. On a previous visit conducted by ELF, measurements were taken of the Douglas-fir trees that survived the mid-1800’s fire that swept across the lower Elphinstone slopes. The old trees are referred to as ‘Vets or Veterans’ as they have survived wildfires, pests, early logging and the onslaught of industrial clearcutting. The largest tree in the Wilson Creek Forest is recorded at 7’ 7” (2.31m) in diameter. It’s estimated to be an amazing 225’ (68.58m) in height. 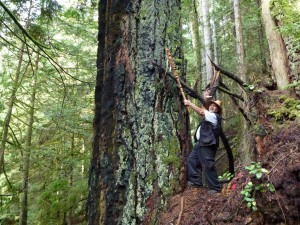 The second largest Doug-Fir in the area is 7’ 4” (2.23m) in diameter. 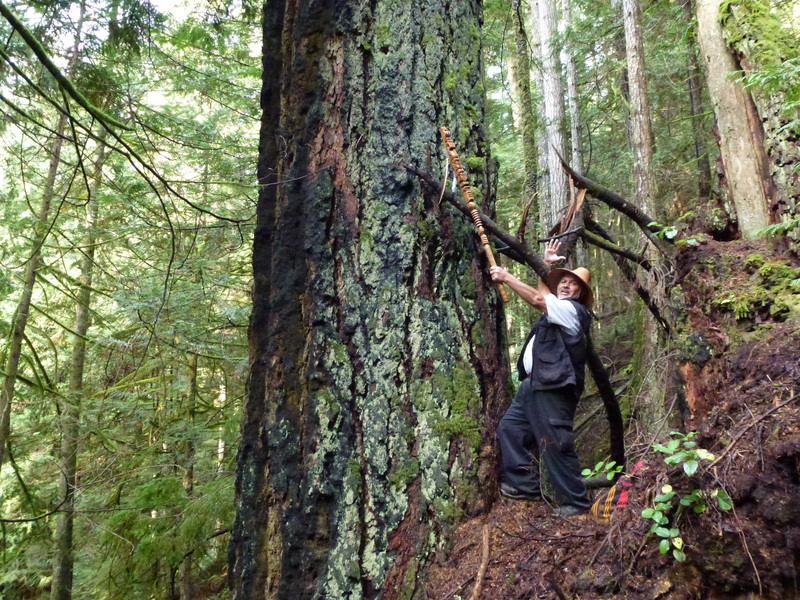 This 7’ 7” diameter tree is the second largest known tree on the lower Sunshine Coast. 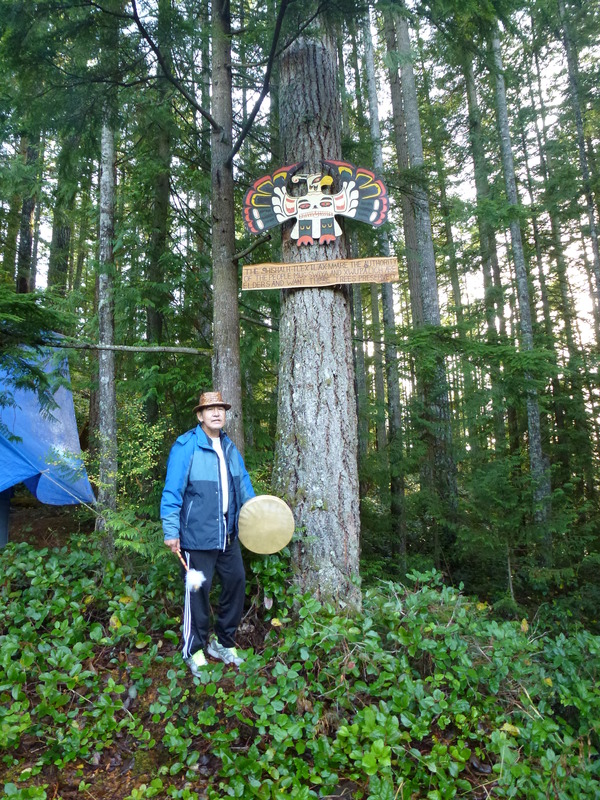 It’s shocking, but the beautiful Wilson Creek Forest is in immediate danger of being logged by the by Sunshine Coast Community Forests (SCCF), owned by the District of Sechelt. They have made it know that they have suspended public dialogue on the issue. 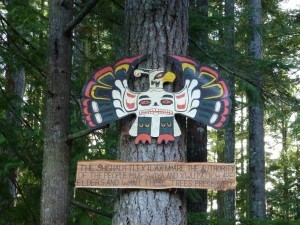 Destruction of this forest, with its natural and cultural heritage, for the sake of a few log sales, would be a travesty. 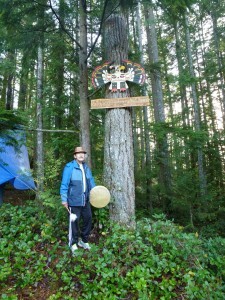 We must stand with the elders to protect it for the sake of the past and the future.